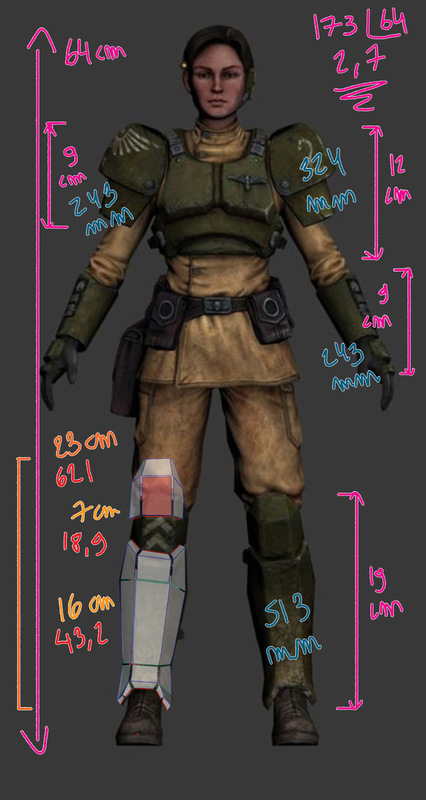 So , now that i have a little free time on my hands , i decided to start working on a costume i've been wanting to tackle for ages : a simple Guardsman ! I'm currently tired of building a crap ton of Star Wars kits and i want something else for Conventions , both local and abroad , and given my current grim dark mood , a Guardsman is the perfect choice . I'm doing a Cadian not only because it's the most iconic regiment out there , but also because i really love Cadians , especially since the fall of Cadia . I'll probably work on a Tanith Scout afterwards , using the same files . Said files are up there in the library , they're mine . I scaled them to my size and exported them in PDF format to print in a store , saving me the trouble of having to re-trace all the patterns on thick paper . I just prefer to pay a dozen or so euros and get everything printed on cardstock straight away , something like 250-300g paper . Going for the good old Pepakura / resin / fiberglass route . I prefer that to squishy foam that might get damaged if i decide to bring the costume abroad . And so it begins , the endless process of cutting pieces on at a time . I hope i can post regular updates on this one and finish it by December or so , or College will get in the way again . Laid out on my humble working table , ready for the build ! Chest in now roughly 75% finished , some three quarters of the back is still missing . 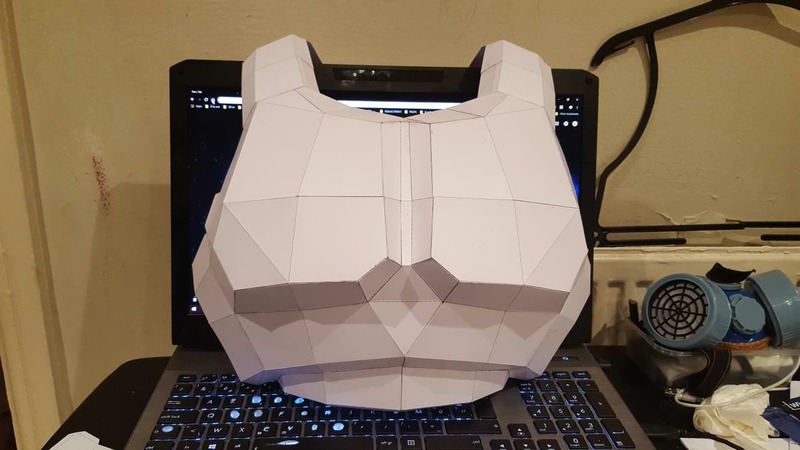 It looks awfully small , so i might have to make two vertical cuts on each side of the chest and add a strip to widen the armour , and enlarge the back in the middle . 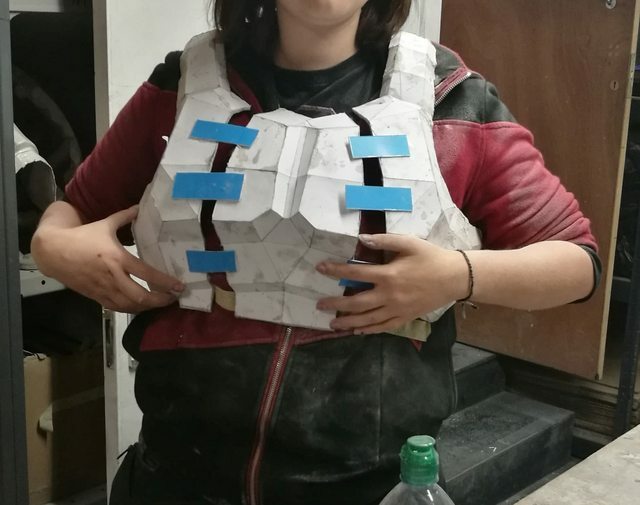 I'll have to check once the armour is built , i trust my measuring techniques . The shoulder bridges will have to be cut somewhere in order to allow my head to go through . And it'll be easier for transport too . 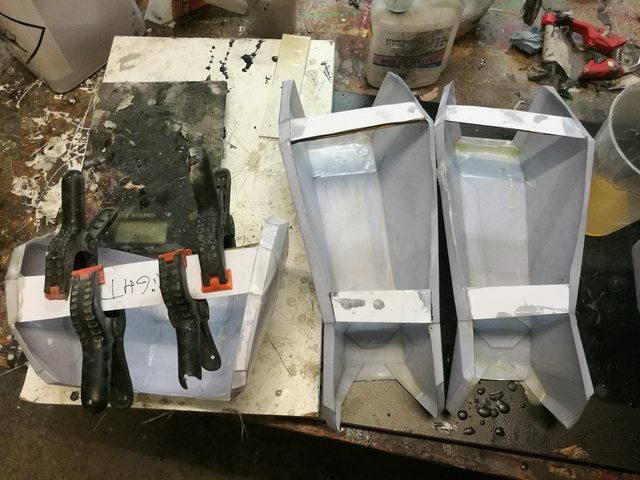 If you're into pepakura and stuff , you know by now what fiberglass is , but if you've never heard of Rondo , well , it's basically a 50/50 mixture of Resin and Bondo . 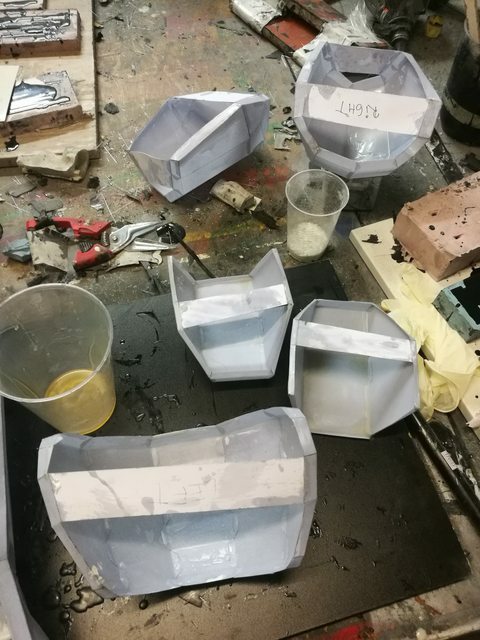 It's essentially more liquid than Bondo , and more solid that Resin , it sort of self levels when you pour it into a pep model , but don't hesitate to brush it down with acetone to smooth it out . Rondo WILL seep out of any hole in your model , bear that in mind . I think the model is still fairly symmetrical , but it has definitely warped a little in some place , which was expected . Never hesitate to reinforce your pepakura model with strips of cardboard in openings and large flat area to avoid warping . And unless you want to waste money and time , make sure you initially build your stuff with cardstock , bare minimum of 250g papers , more if you can . That's why i'm usually printing my patterns in printing shops , they can print on A3 and larger formats and straight on heavier grades of cardstock , while you will just jam your printer attempting to do it , or spend afternoons re-tracing all your patterns on thicker paper . After a long absence , i return to serve the Emperor ! Unfortunately , the Ruinous Powers have been at work as well and killed the machine spirit of my phone and i haven't been able to salvage the pictures i took during that time . 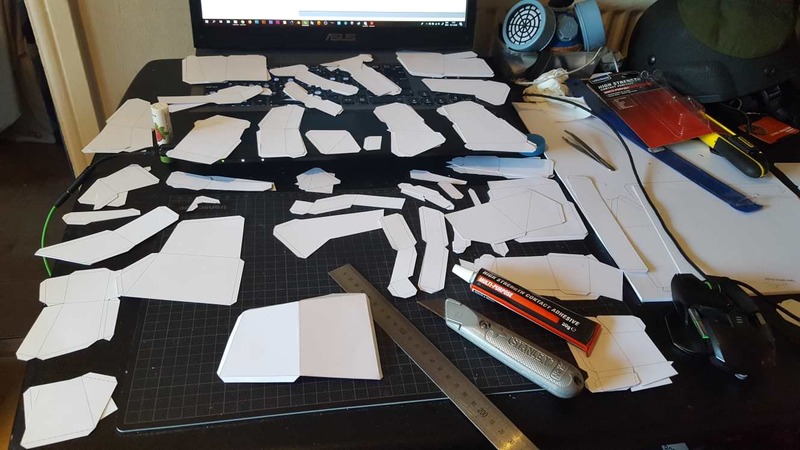 Also , because i see a lot of posts over here that sound like it's people's first time building a costume , i'll keep dispensing a few very basic tips for those who would like to try out pepakura for the first time . 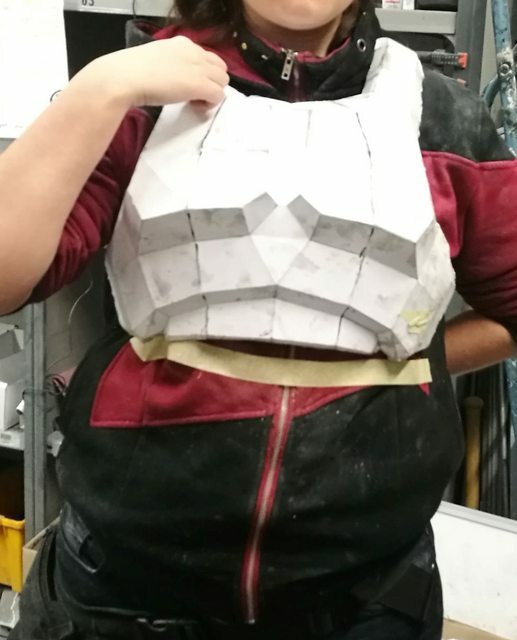 It'll always be a longer and more tedious process than building a foam armour , but at the end of the day , if done correctly , it'll yield a long-lasting and better looking costume . THAT YOU CAN CAST !! 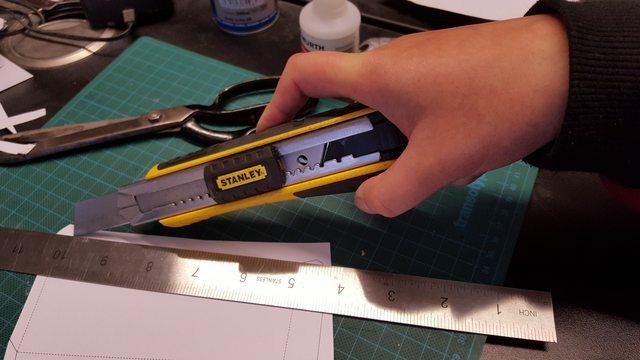 Tip of the day : Hold your blade at an angle , and hold it further away from the blade instead of really close like you would with a pencil , you'll be able to put more weight on the blade and make cleaner cuts instead of having to go over your cardstock several times . Also , invest in a good blade , those cheap craft stores xacto blades are worthless , get yourself a real Stanley . You blades will last longer , cut sharper , and you'll have a solid grip on your craft knife . Fat Max is the way to go . So , i also finished applying resin to the armour . But before that i knew i would have to make alterations to the armour as everything seemed to end up a little too small . Re-print and re-build you say ? Yes , yes i could've done that . But did i want to ? No , i did not . So i went ahead and gave two coats to each part , one inside one outside so that the pieces would have enough structural integrity and rigidity to them to stop warping without the supports , but remain flexible enough to alter in shape easily . Trying to pieces one by one to guesstimate how many centimetres i had to add to each piece . The chest may look like it's fine , but really it's too small . Ideally it should sit below the masking tape . Now i'll also have to rescale it vertically as i find the piece to start looking slightly out of proportions . Cut just above the last ridge and glue a few plastic strips before matting the inside with fiberglass and filling the outside with bondo filler .